The roaring 20's are about to come to an end, but 1928 sees history being made. Penecillin is discovered, the television is released to consumers and Admiral Byrd began his expedition to the Antarctic. 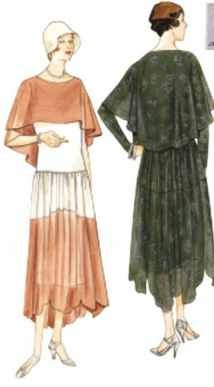 This typically flowing 1920's dress has dropped waistline and handkerchief skirt. Perfect for any lunch or dinner at Downton Abbey.